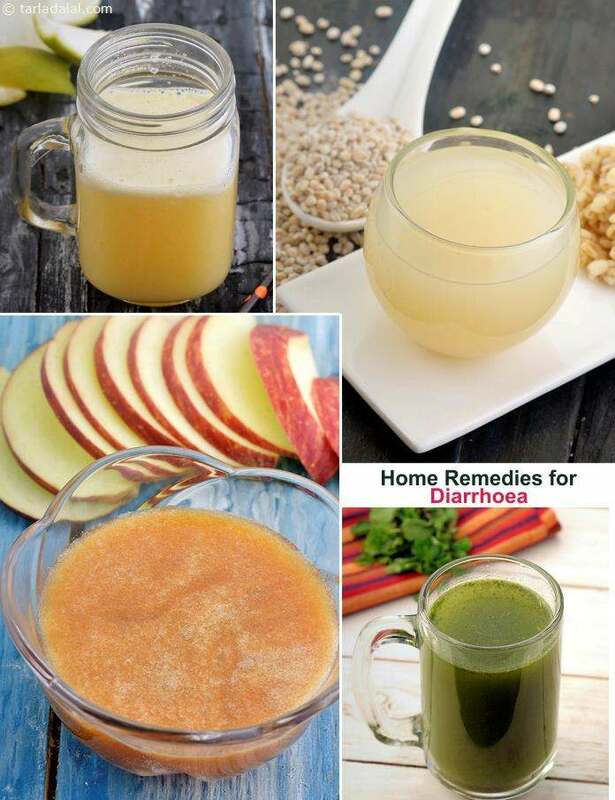 Diarrhoea is referred to as frequent passage of watery stools which leads to the depletion of fluids and salts (sodium and potassium) that are responsible for maintaining the fluid balance in our body. 1. Salt and sugar: The best way to replenish the lost fluids is to mix a tsp each of salt and sugar in a cup of water and sip it as many times as you can. 2. Fenugreek (methi) seeds: One tsp of fenugreek seeds should be swallowed (without chewing) with a cup of curds, buttermilk or water for immediate relief. 5. Garlic (lehsun): Garlic is yet another natural remedy that fights diarrhoea and helps to kill parasites. It is a powerful and effective antibiotic and aids digestion too. 3. Fermented foods like dhokla, bread, idlis, dosas, cheese etc. 1. Consume small and light meals frequently instead of 3 big meals a day to replenish the lost nutrients. 2. Have plenty of fluids like lemon juice, fruit juices, vegetable soups (of carrot, spinach etc. ), watery dals (of barley, moong dal etc. ), lassi, coconut water etc. to make up for the loss of fluids. Rice Porridge , is also an excellent alternative to restore the fluid levels. 3. Have fruits like banana and apple as they are rich in potassium which helps to maintain the fluid balance in our body. 4. Try to restrict the consumption of milk and other dairy products in the beginning, as these are difficult to digest. If you must eat, curds is the best choice of all dairy products to digest. 1. Always wash your hands twice with soap before eating anything and dry your hands with a clean towel as wet hands carry a significant risk of infection. 2. Eat only fresh foods that have been well cooked. Raw foods like salads can irritate your system. 3. Avoid local drinking water in places where there is a high risk. Have packaged water instead. 4. Avoid consuming foods from food stalls on the street, though they may seem exciting, because they are unhygienic. 5. Avoid consuming chilled drinks. This does not cause infection but may lead to stomach cramps. This is the easy and main remedy for those who suffer from loose motion. Also a good appetite. Garlic is very good for heart and in arthritis. A remidy for instant relief in case of gas and/or acidity. Tarla Dalal Hi Manohar, Thank you for your kind words. Happy to know you liked our suggestions.